On March 21, 2014, Governor Bill Haslam signed TCPA-sponsored legislation designating the Mississippian statue, sometimes referred to as “Sandy,” as Tennessee’s official state artifact. More information on that process and on the artifact can be found below. Tennessee’s State Artifact, the Mississippian stone statue from Wilson County Tennessee. Photo by David H. Dye. At the January 24, 2014 TCPA business meeting, Board member Jared Barrett proposed that the organization promote legislation naming the 700-year old Mississippian statue from Wilson County as the official artifact of Tennessee. The motion passed unanimously, and TCPA approached legislators asking that Sandy be listed among the official Tennessee state symbols. Bills sponsored by Sen. Mae Beavers (R-Mt. 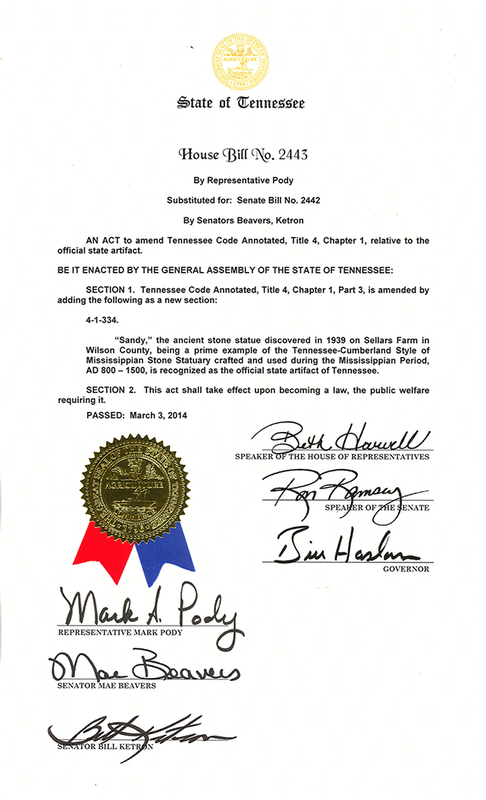 Juliet) and Sen. Bill Ketron (R-Murfreesboro), and by Rep. Mark Pody (R Lebanon), passed through the House and Senate on March 3, and the state artifact legislation was signed into law by Governor Haslam on March 21, 2014. In their 2009 volume on Tennessee-Cumberland Mississippian stone statuary, Dr. Kevin Smith and James Miller wrote that the artifact was one of the “most intricately and realistically portrayed Tennessee-Cumberland style statues discovered to date.” That volume provides a complete description of the circumstances surrounding the recovery of the statue and significance to its Native American creators. 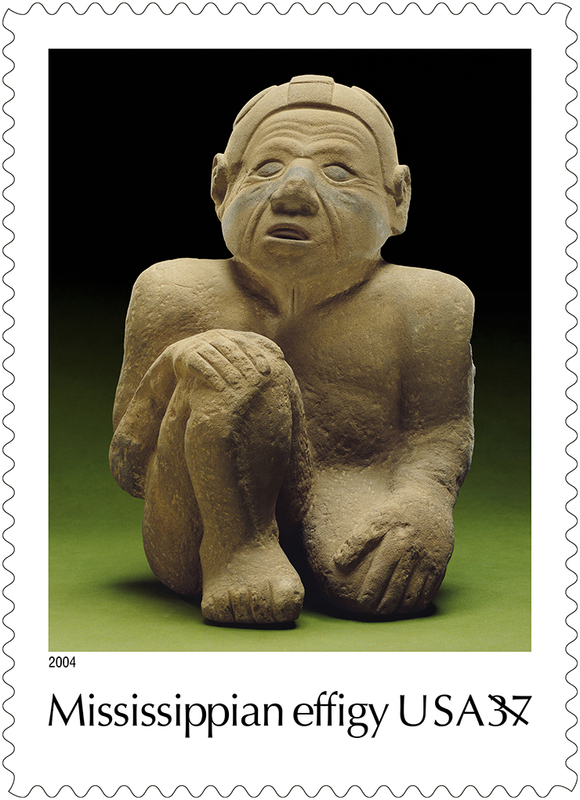 US Postal Service stamp featuring the stone statue from the 2004 series “Art of the American Indian.” Image courtesy of the Tennessee Council for Professional Archaeology. 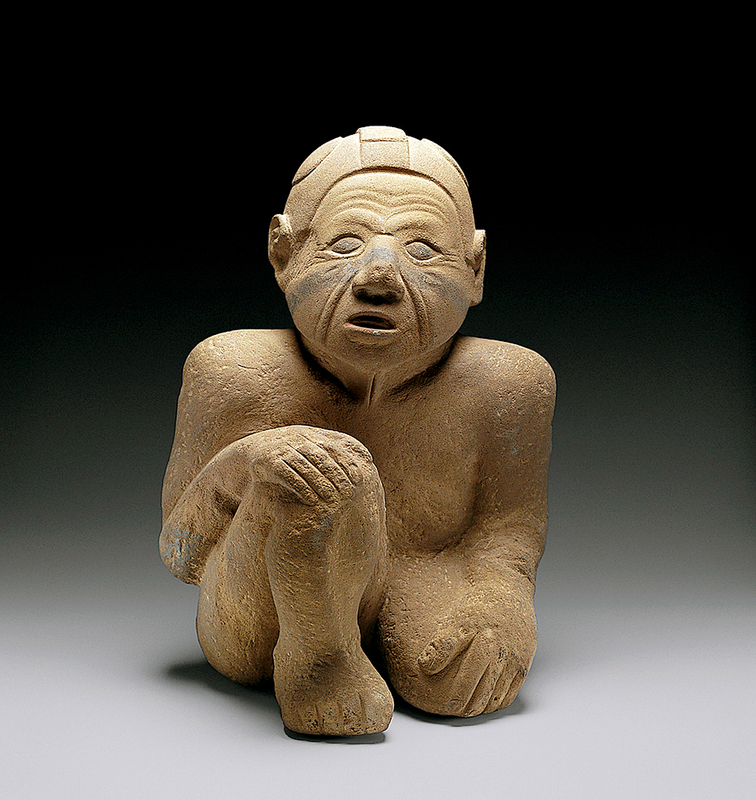 For nearly 50 years the statue was the icon of the Tennessee Archaeological Society, and has been included in numerous publications on ancient Native American art and archaeology. Among these appearances, the statue was featured in Time Magazine in 1941, appeared on the cover of a Time-Life Books publication in 1942, and in 2011 was featured on the cover of the scholarly volume Visualizing the Sacred: Cosmic Visions, Regionalism, and the Art of the Mississippian World. In 2004, Sandy appeared on a US Postage Stamp as part of the 10-stamp “Art of the American Indian” series. The statue has also been part of major art exhibitions, including the Art Institute of Chicago’s 2004-2005 exhibit “Hero, Hawk, and Open Hand,” and was featured in the 1992 exhibition “Trésors du Nouveau Monde at the Musées Royaux d’Art et d’Histoire” in Brussels, Belgium. 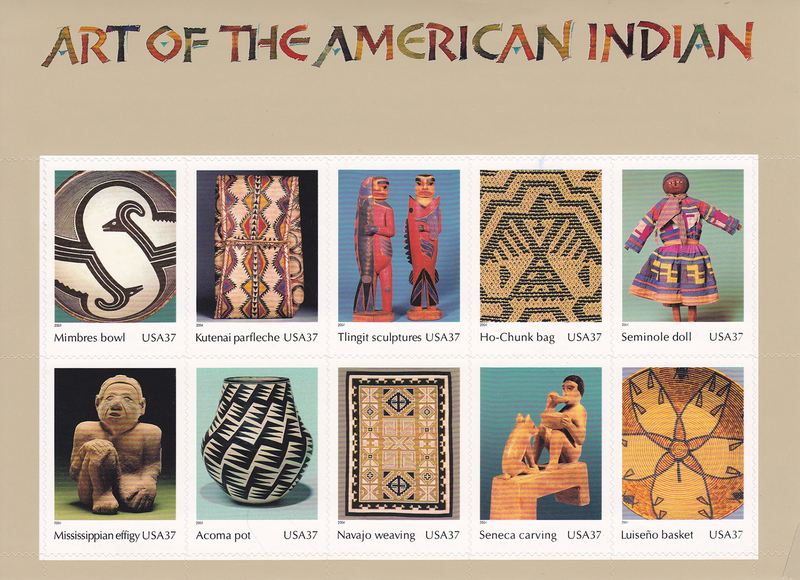 The Tennessee State Artifact is on display at the McClung Museum of Natural History and Culture at the University of Tennessee-Knoxville, located at 1327 Circle Park Drive on the University campus. Museum hours are 9 a.m. to 5 p.m. Monday to Saturday and 1 p.m. to 5 p.m. on Sundays. Admission is free.